Ben Tate played for the Auburn Tigers in college. His best season came as a Senior when he ran for 1362 yards and 10 TDs on 263 carries. He finished his college career with 3321 yards. He had some amazing highlight film that really emphasized displayed his burst and size. I immediately tapped him as being selected by the Texans in the second or third round. Tate was one of the best backs available in the draft. After missing out on Ryan Matthews and bypassing Toby Gehart the Texans traded up to select Ben. He’d join a crowded backfield with Ryan Moats, Arian Foster, Jeremiah Johnson, Chris Henry, and Steve Slaton in 2010. Both he and Johnson tore up the Cowboys defense during the preseason, but Tate injured his ankle during the game. He’d be on injured reserve the entire 2010 season. Tate paired with Foster to form a nasty duo in 2011, and ran for 942 yards in 15 games. During that season Tate suffered from a myriad of injuries from his quadraceps, to his back, and to his groin… ankle and foot. Nonetheless, it was rumored that the Browns offered a 2nd round pick for Ben in the off-season but the Texans decided to reject the offer. Tate was nagged by injuries in 2012 as he gathered a paltry 279 yards. Head, toe, hamstring, were among the malaise of ailments that kept Ben on the injury report and on the bench 15 games that year. With Foster on IR for the entire 2013 season, Tate was counted on to step up and ran for 771 yards on 181 carries in relief of Foster. It was a contract year for Tate, and he was ‘running for dollars’-to Free Agency. He played through a lot of injuries again. The Texans meanwhile collapsed to a 2-14 record, and Gary Kubiak and his coaching staff would be released. 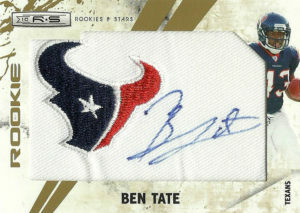 The Texans were faced with a dilemma- resign Tate to a monstrous contract and cut Foster or keep Foster and let Tate walk. It was quite the debate but in the end the Texans chose Foster over Tate. Ben signed a large contract with the aforementioned Cleveland Browns in 2014. He showed up to camp out of shape, and not well conditioned but planted as the #1 back in the team’s RB rotation. He ran for 333 yards on 106 carries, but after missing two games early in the season due to injury, and then being embarrassed in a home game against the Texans rushing only 2 times for -9 yards the writing was on the wall. He’d be cut the following week, but quickly found gainful employment with the Minnesota Vikings. In 3 games he’d run 13 times for 38 yards before Tate was cut again. The Steelers then picked him up for a game and Ben carried the load 5 times for 19 yards as an injury replacement for Le’Veon Bell. After the season, Ben received some nibbles in Free Agency, from the Cowboys, Lions, Chiefs and 49ers at various points of 2015, but ultimately was not signed. It’s tough to categorize where Ben falls, and my personal experience and observation, coupled with his body of material you could color Ben’s desire and commitment either way. Confident I’d never see my cards I sent him again, I decided to go ahead and buy this certified autographed patch card and close the book on this player.